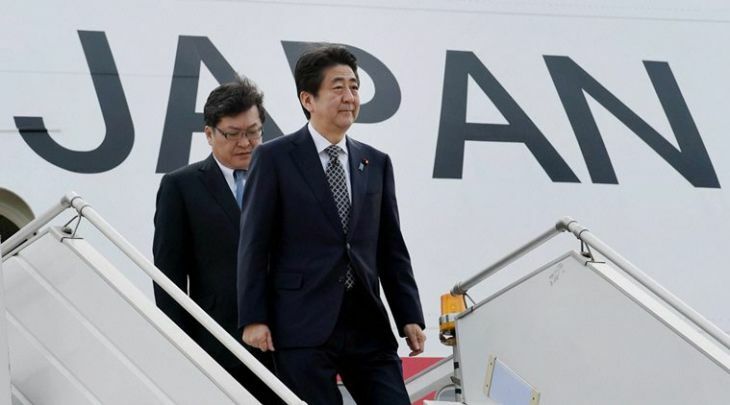 Japanese Prime Minister Shinzo Abe on Friday arrived in India on a three-day visit. Welcoming his Japanese counterpart in Delhi, Prime Minister Modi on Friday described him as a "phenomenal leader" and said his trip will further deepen the bilateral relations. "Liked how PM @AbeShinzo describes India-Japan ties, the rich potential & cultural bond in his piece" in a newspaper, Modi tweeted. A Rs 98,000-crore deal to build a bullet train network is among a number of agreements likely to be signed during Japanese Prime Minister Shinzo Abe's three-day visit beginning on Friday during which he will hold annual summit talks with his Indian counterpart Narendra Modi. The focus of the visit will be on forging greater synergies between two major Asian economies and take forward the special strategic ties. In the 9th annual Indo-Japan summit talks on Saturday, Modi and Abe will review implementation of various decisions taken in course of last one year to enhance economic ties, particularly in the trade and investment sector. PM Modi said Abe's visit will deepen Indo-Japan relations. Sources said a number of agreements including awarding the Rs 98,000 crore contract to build India's first bullet train network will be inked. After the talks, he will leave for Varanasi, which is Modi's Parliamentary constituency, where he will attend Ganga Aarti at famous Dasaswamedh Ghat. Modi will accompany Abe during his nearly four-and-a-half-hour-long visit to Varanasi. Abe will return to the capital in the evening. The Japanese Prime Minister had accompanied Modi during his visit to Kyoto last year. In Delhi, Abe will call on President Pranab Mukherjee, attend a Japan-India innovation seminar and interact with a group of business leaders. At the last Summit meeting held in Tokyo last year, the two prime ministers had agreed to elevate the relationship to "Special Strategic and Global Partnership". Modi had visited Japan from August 30 to September 3 last year during which that country had announced doubling of its private and public investment in India to about USD 34 billion over a period of five years. During the summit talks last year, Modi and Abe had agreed to enhance defence and strategic cooperation to a new level and also decided to speed up negotiations on civil nuclear deal. While agreeing on greater defence equipment and technology cooperation, the two sides had decided to expedite discussions on modalities for the sale of Japanese US-2 amphibian aircraft. Foreign Secretary S Jaishankar had held talks with top Japanese officials in Tokyo last month to finalise agenda and other details of Abe's visit. India and Japan have been expanding their economic and strategic engagement in recent years resulting in cooperation in a vast swathe of fields including defence and security. The economic engagement witnessed significant rise after both countries signed a a Comprehensive Economic Partnership Agreement (CEPA) in 2011.